Emilie Shapiro's fluorite earrings are inspired by the sunrise over Lake Titikaka. Emilie Shapiro's exquisite earrings were inspired by a breathtaking sight—the sunrise over Lake Titikaka in Peru. 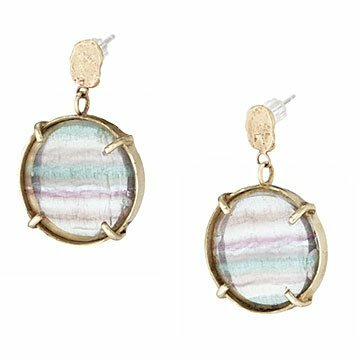 She showcases hand-selected disks of purple and blue-green fluorite set in lustrous, recycled brass to reflect those colorful South American skies. Fluorite is thought to promote wholeness and clarity, adding a spiritual dimension to the design. Sterling silver ear posts. Each piece will vary slightly due to the uniqueness of the stones. Handmade in New York City. Make it a set! Click here to see the matching Dreamer Necklace and matching Dreamer Ring.